A Far Cry game is never complete without its trademark badass villains and enemy types. Far Cry 5 is no exception to this. 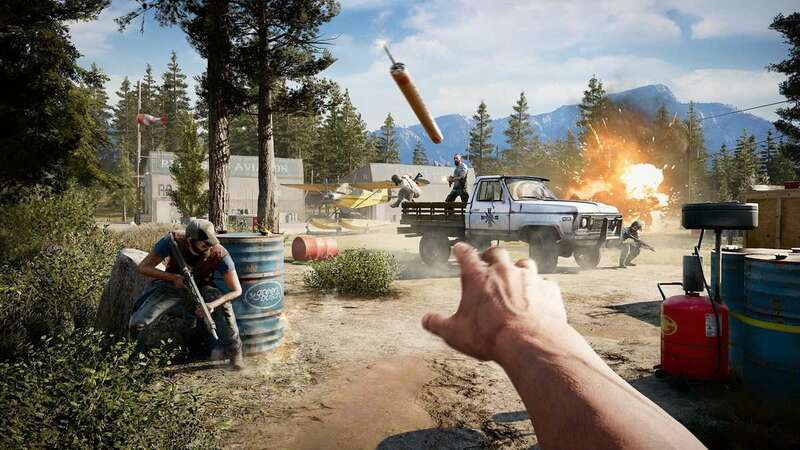 Our Far Cry 5 Enemies Guide will let you in on some of the enemies that you will come across in the game and how you can tackle them. Taking down the Seed family and the popular cult associated with it is not easy. A lot of enemies will come in your way throughout the game. Be it during a scripted sequence like in the main storyline mission or completely surprisingly during one of your free-roam sessions, the enemies need to be dealt with. Most of these are easily taken out by a long-range sniper or a close quarter shotgun but some need other tactics to be tackled. Below are some enemy types and some basic info on them, however, first you need to know of the Project at Eden’s Gate. In case you have been wondering what cauldron the developers brewed the term Peggies, it stands for Project Eden’s Gate. PEG is a cult led by Joseph Seed of the Seed Family which members the locals refer to as the Peggies. They have a massive weapons arsenal and immense manpower to oppress the non-believers. They have modified WWII aircraft and even domestic planes fitted with machine guns. Among the forces, there exists ranks and division suited to the abilities of the respective. These will carry a variety of different weapons including rifles, pistols, sniper rifles or melee weapons. The most common enemy type, they are easy to be dealt with since they do not have any armor or protection. Additionally, their weapons types are of the lowest rank. These match your standard cultists in their weapon types but they come equipped with an armor. It is recommended that you perform headshots on these type of enemies since a lot of bullets are required before the armor is damaged enough to make them vulnerable. They are the cult leader that have a distinct appearance: their red crown tags and the bliss radiating from their slightly covered faces. Without armor but they make up for it in the form of brute strength. They have much better accuracy than the normal cultists have and will knock out the enemy with some closely calculated shots. Moreover, they will knock down anyone who gets too close. Headshots and shotgun is recommended to tackle this enemy type. After being defeated, they grant you some Resistance points. These are Heavy Gunners that use light machine guns dispensing large volumes of fire. They come wearing both an armored vest and a helmet. This makes them particularly strong against small firearms. Use powerful rifles to knock down their helmets and then perform a headshot. Since they come with a machine gun, it is advisable to not be in an open field. Either take them out stealthily or use explosives to do the job. These are armored cultists armed with shotguns. They charge in a strategic manner and bring along a special gift; they use smoke grenades to disorient the target and use it to their own advantage. Boosting the same armor and health stats as the Cultist Heavy mentioned above, they wear helmets too. However, they use a flamethrower to set fire to close ranged opponents. You can either take them out using a silent takedown. Alternatively, you can try to concentrate your fire on the fire tanks equipped with their backs. This will result in a huge explosion killing these enemy types. Make sure to keep your distance from Farmer at all times. They hide in places you cannot usually make out. They use camouflage abilities and cannot easily be spotted. The Hunters use bow and arrow that they have mastered. They strike deadly blows and just like snipers, they prefer to stay at a distance. They would often set their arrows ablaze to smoke targets out of hiding. Snipers obviously use snipers and have a very precise target never missing a shot. It is also important to know that they use Judges to coordinate their attacks. Snipers are detectable because of their red-laser aim. They, however, reload much faster than the Hunters do. Hunters in the game will use bow and arrows to inflict damage. You can use binoculars or your pet Boomer’s abilities to mark these enemies from a distance. This will give you the edge in tackling them. Situated in cult outposts and high ground. Use explosives like the rocket launcher; they can bring down choppers, land-based vehicles, and also hit enemies behind barriers. Therefore, if you are raining hell from above or on the ground, the moment will be short-lived because of these Launchers. Kill them first before moving onto other enemy types. They do not wear any armor, so any firearm would do. They are specially trained and equipped cultists trained to tackle the resistance. Usually working as pilots for the Cult, these ‘Chosen’ enemy types will hunt you down when the Resistance level of a particular area has been increased to level 2. They wear red hoods over their heads covering their arms as well and over it; they wear grey jackets. They usually appear in aircraft and sometimes on ground as well. However, they are much deadlier on foot and much more resilient and swift with their blows. Hell they are chosen for some reason. They come equipped with AR-C, AR-CL and Recurve Bows. They are trained to use a variety of weapons ranging from bow and arrows to wartime aircrafts and heavy firepower. They can be taken out mounted weapons or launcher-type weapons. Also, note that these weapons may sometimes also attack from land. So be wary! These are the rogue enemy types of a basic level who have been made to follow the cult by a mysterious drug known as Bliss. They are made of the ones who resisted the Faith’s mind control. They will only come equipped with a melee weapon but the strength lies in their numbers. These appear to be zombies, but in an apparently supernatural manner as a mist emanates from their bodies that disappears when they die. They also wear a mask that is believed to be the outcome of their torture, where their mouths were surgically altered. They can also be distinguished by their loud screaming and zombie-like mumbling. They usually use melee weapons at close range. Moreover, when outside melee range, they throw rocks that deal little damage. They will swarm you often but shotguns will do the trick. However, if you doubt your close range shotgun skills, try to take them out when still at distance. In addition, the ‘bait’ you use for fishing can be upgraded to attract these Angels. So that way, you can also pick them off, one by one. The animal category of enemies, Judges are typically white-coated wolves with a red cross on their heads. They also have their tails removed for some unknown reason and the cross on their head are presumably blood. They have been affected by ‘Bliss’ and trained specifically to track down escaped Eden’s Gate prisoners. Hunters also use them. Others will include bears and cougars. You will only come across them during missions. Being deadly because of the way they were experimented to do so, Judges can only be put down by heavy machine guns or powerful shotguns. Nothing else. This is all we have in our Far Cry 5 Enemies Guide. If there is anything else that you would like to add, let us know in the comments section below!